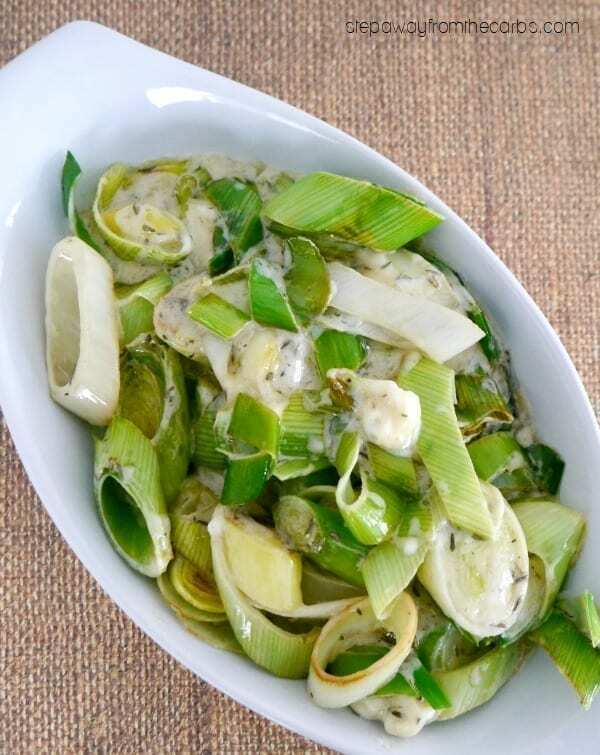 These leeks with blue cheese creamy sauce are a wonderfully rich low carb side dish. LCHF and gluten free recipe. Leeks are one of my favorite vegetables! 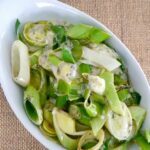 There are about 11.5g net carbs in a cup of sliced leeks (approx 90g) – which makes them low-middle on the veggie-carb scale. 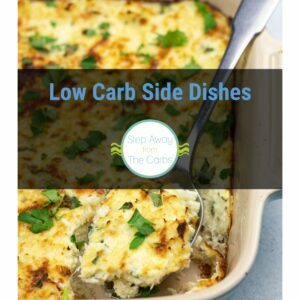 I love serving them steamed with some low carb white sauce, and they are wonderful roasted, too. This recipe pairs the mild onion flavor with earthy thyme and rich blue cheese and cream. It is quite a combination! Remove the outer leaves from the leeks and trim the coarse leaves and root. Rinse well to remove any residual dirt, then cut into slices. Melt some butter in a pan, then add olive oil, the sliced leeks and some dried thyme. 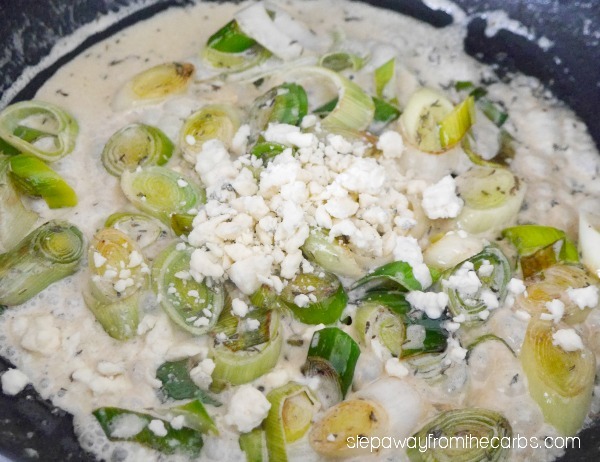 Saute gently until the leeks have started to soften. Add in some heavy cream and let it bubble for a minute or two. The sauce will start to thicken. Add some blue cheese crumbles. Stir to mix, then serve immediately. This works really well with grilled chicken or fish. Slice the leeks and set aside. Melt butter and oil in a pan, then add the leeks and thyme. Saute over a low-medium heat for 8-10 minutes until softened. Add the heavy cream, and let the sauce bubble for 1-2 minutes until starting to thicken. Stir in the blue cheese crumbles and serve.